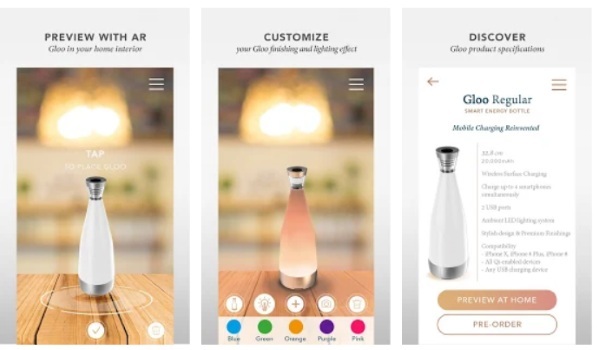 Gloo itself is a shining charging station that looks like a bottle. It’s very pretty and uses both Qi and standard USB options for charging your smartphone. How exciting! It also doubles (triples?) as a panoramic camera and mood lighting. Neato. Neater is that you can preview what this item will look like in your house with the app. Not that you really need to. The product is small so it’s not like it’s a big deal if it doesn’t match the drapes but it would be really nice to get this technology for other large purchases like furniture. How will that couch really look? Is that bookshelf really the right size for that space? Anyway, you can check out this product with the free app.